Recently the world witnessed a savage attack on a United Nations and Syrian Red Crescent humanitarian convoy, and on a hospital near Aleppo. This week, at the United Nations Security Council (UNSC), New Zealand will lead discussions on the protection of hospitals and patients. In a year when over 100 medical facilities have been attacked, it is a chance for New Zealand and all States to ensure that 2016 is the last year that hospitals are bombed while the world watches in silence. ICRC President Peter Maurer, addresses the UN Security Council via video feed 28 September 2016. earlier MSF President, Dr Joanne Liu spoke to the chamber, demanding the UNSC permanent members implement the 2286 resolution passed in May 2016, for the protection of civilians and healthcare in conflict zones. To ensure support for doctors fulfilling their responsibility to treat all wounded, regardless of who they are fighting for. To ensure that even war has rules and that seeking or providing healthcare is not a death sentence. In May, following devastating attacks on hospitals in Afghanistan, Yemen and Syria, the UNSC unanimously adopted Resolution 2286. The Resolution, sponsored by New Zealand, was meant to reaffirm the protection of hospitals, patients, medical staff and transport. At the time, Médecins Sans Frontières called on all States to uphold their obligations and not let Resolution 2286, like so many others before it, amount to empty rhetoric. Despite the New Zealand Government’s instrumental role in its passage, unfortunately the Resolution has become just that. At least 21 medical facilities Médecins Sans Frontières supports in Yemen and Syria have been bombed or shelled since the beginning of the year. Every day our teams on the ground see Resolution 2286 violated with impunity, along with the international humanitarian law it sought to uphold. A hospital worker salvages the remains of undamaged medication and equipment left in the emergency room after the 15 August Saudi-led coalition airstrike which destroyed the Abs hospital killing 19. Just last month, aerial bombs struck Abs hospital in northwest Yemen. The blast immediately killed nine people, including an Médecins Sans Frontières staff member. Two patients died while being transferred to another hospital. The number of dead would quickly rise to 19. Abs hospital, supported by Médecins Sans Frontières for over a year, was partially destroyed. The location was well known. The hospital’s GPS coordinates were repeatedly shared with all parties to the conflict. It was the fourth attack against an Médecins Sans Frontières facility in Yemen in less than 12 months. 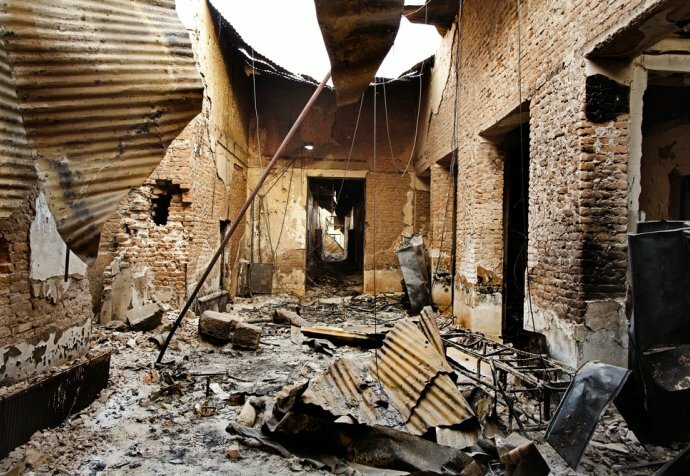 It came less than a year after precise repeated strikes from a U.S. gunship destroyed the Médecins Sans Frontières Kunduz hospital in Afghanistan, killing 42 people, including 14 of our staff. That same month of October 2015, 17 Médecins Sans Frontières -supported medical structures were bombed in Syria. Some in areas where only the Russia-backed Syria-led coalition is active, others in areas where the US-led coalition is engaged as well. These represent just a portion of the staggering 94 attacks Médecins Sans Frontières recorded on the hospitals it supported in the country in 2015. In both Yemen and Syria attacks, four of the five permanent members of the UNSC are implicated in some way. The damaged Al-Quds hospital building (R) following reported airstrikes on the neighbourhood of Sukkari in the northern city of Aleppo, Syria. Beyond the immediate loss of life and destruction, each new attack leaves the most vulnerable people without access to healthcare. It depletes the already diminished local medical staff. And it leads to people avoiding hospitals and lifesaving treatment for fear of being bombed. As these attacks continue, they are denied outright, met with silence, justifications, or simply brushed away by their perpetrators as mistakes. How can we as doctors provide care when hospitals are considered as legitimate targets? How can we fulfill our responsibility to treat all wounded, regardless of whose soldier they are, whose enemy – whether terrorist, criminal or civilian – if States see attacks on medical facilities or sick enemies in hospitals as legitimate and without consequence? 3rd October 2015 attack on the MSF Kunduz Trauma Centre in Afghanistan. At the time of the airstrike, the operating theatres were in use – there were patients on the tables being attended to by surgeons and anaesthetists. These attacks are not mistakes. They are unscrupulous and illegitimate attacks on functioning medical facilities. To date, Resolution 2286 has made no difference on the ground. There is a clear lack of political will from all States, who are yet to translate their words into action. New Zealand has already shown its leadership in the international community by drafting and supporting Resolution 2286. This week, our country must continue to demonstrate that leadership by calling on all UN Member States to put in place unambiguous absolute red lines when it comes to the conduct of hostility. Bombing of hospitals and aid actors is an absolute red line. Beyond this New Zealand must support the call for accountability, including prompt, independent, impartial investigations and oversight mechanisms. 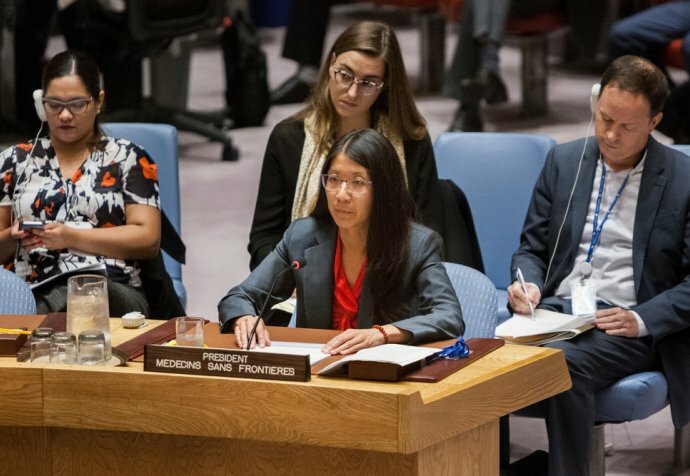 When hospitals and other civilian structures are attacked, the international community must mobilise to ensure payment of the highest possible political price for the perpetrators. This week New Zealand and the UNSC must go beyond empty rhetoric. Attacks against the medical mission cannot be the new norm, and we must not let them be the business as usual they are becoming. Dr Matthew Reid is a Christchurch doctor and Médecins Sans Frontières Australia board member.